I did wonder how that happened, but the car has been driving fine otherwise; no pulling of any kind. Today, I was going to the store and noticed an occasional light popping sound. When I got back to the house, I jacked up the car and wiggled the wheel at 3 and 9 o'clock positions and did get a bit of wobble out of it. Nothing out of the 12 and 6 o'clock positions. Tie rods and ball joints looked fine (I've changed those out in the last year or so). Crazy stuff. Never seen nor heard of this one before. My car hasn't been to ANY track of any sort in over 2 years, just daily driven 4 miles back/forth to work and the occasional errand around town. Holy ****... that could have been real bad. Damn Brother what you been doing down there? Yep, I am definitely lucky. I can just envision what would happen, entire left front wheel, hub, brake, etc. 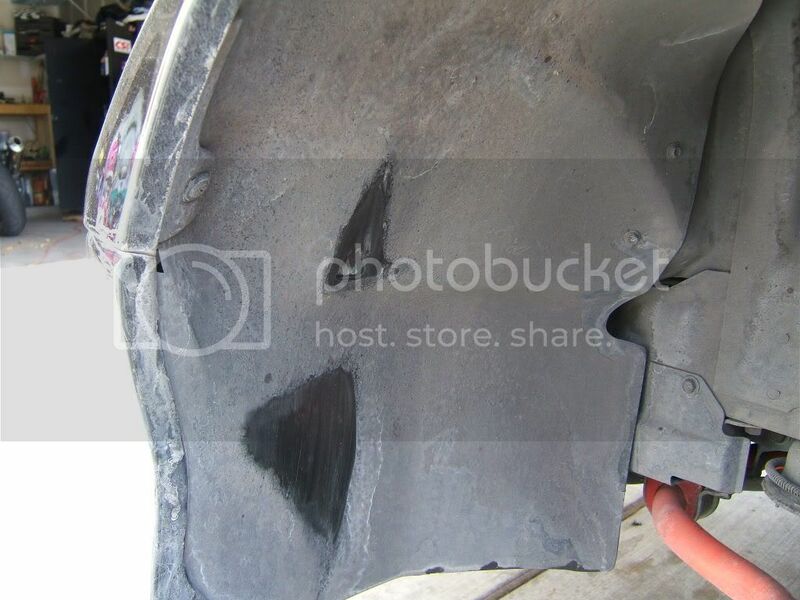 collapsing into the wheel well, Darrell Waltrip screaming over the mic, "Riffel's just lost something----OHHHHH! He's in the wall! Riffel's in the wall!! The season's over for him! Ahhhh, what a tough break!" Boogity Boogity Boogity! I don't know that tubular would be the best way to go on a daily driver. Anyone got any experience w/ them as far as durability goes? I need to keep this car reliable for one more year while the wife's in school. I don't plan on getting rid of this car - it will be a sunny day driver and turn into a restoration/clean-up/hot rod project once it's out of commission as a daily. Did you install new polly bushing in the control arm?? did it break just after that?? Did the poly bushings 5 or 6 years ago. Judging from the rust on the crack it looks like it may have been partially broken for a long time. Glad you caught it before disaster. Pick up skinnier girls at the bar. WOW! You got alot of huge pot holes in your area? Glad you cought it befor you totaled your car. Where did all the hammer marks come from? Do you think maybe that has something to do with it? Where did you pick up those poly bushings? And did they make any difference? The hammer marks were from me back when I installed the poly bushings. It was such a tight fit that the A-arm needed some assistance getting back into place. You can get the poly bushings just about anywhere these days I s'pose. I bought mine from Thunder Racing and installed them about 6 years ago. My overall assessment is if you're the type that complains about road noise and rough ride, don't buy them. I've gotten used to them so it doesn't bother me. The combination of these and really stiff springs tends to make the car ride a bit like a lumber wagon, but again I don't mind it. 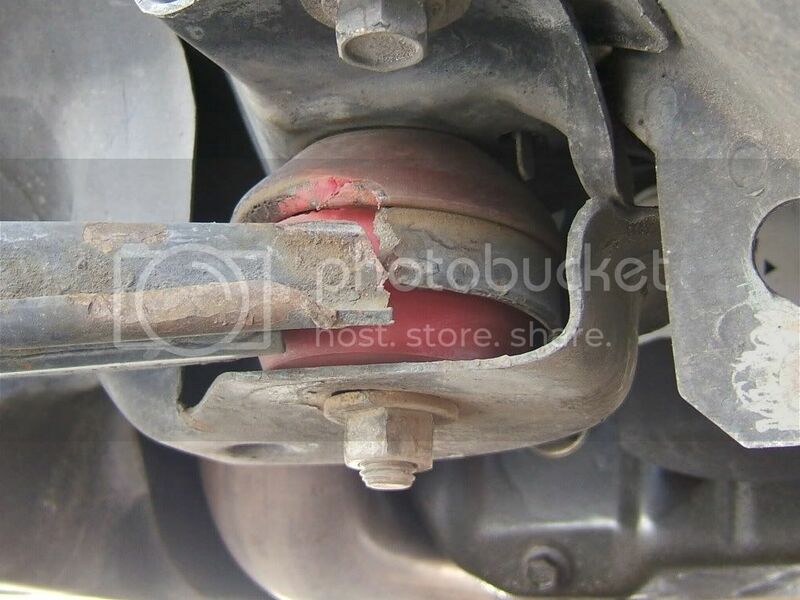 Also, in the winter time the bushings tend to squeak a little bit due to the cold. Something doesn't look right too me. 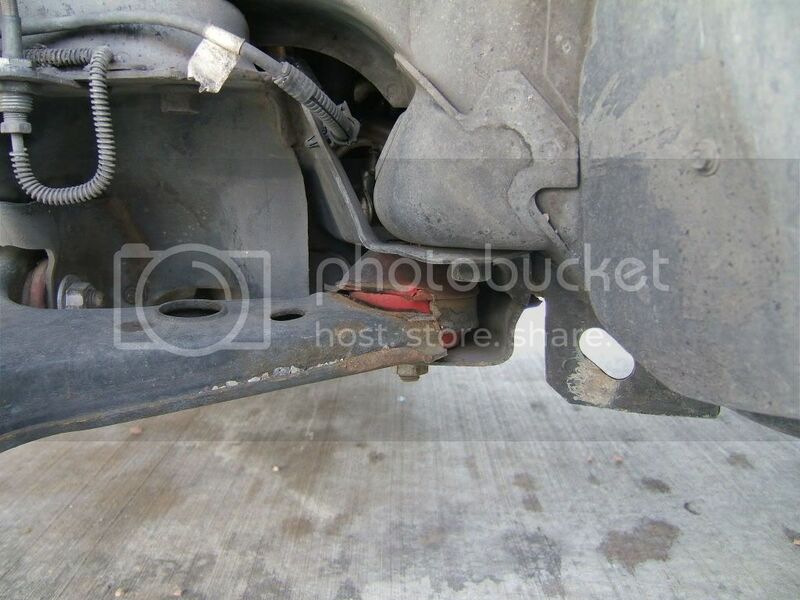 The stock bushing comes in a metal sleeve. Why no sleeve? Poly bushing in that location usually have a high failure rate of the bushing. I have never seen the arm break though. The sleeve you're talking about is in there. I left it in there after burning out the old bushing and cleaned/sanded it out so the new one would fit. I remember taking the sleeve out on the right side because that was the first one I did, thinking it had to come out, but the bushing doesn't fit without the sleeve in it. ok good. I'd get a used a-arm from a junker or someone on this site.. They are usually better/stronger for a DD and RR car. Already on that. Jantzer98SS is hooking me up w/ a good used part. Wow, you don't suppose the poly bushing put a bunch of extra stress on the A-arm, do you? I am being honest here when I say I've never hit anything. I've never run over anything unusual, and this car has never been into an accident. If I were to hypothesize anything, I'd suspect it may be from heating the A-arm from a torch which might have made the metal too brittle. 5+ years later it finally gave up, but then if that were the case wouldn't a guy think it would have happened quite a bit earlier, like during an autocross, but it's been well over 2 years since I've done any of that stuff. 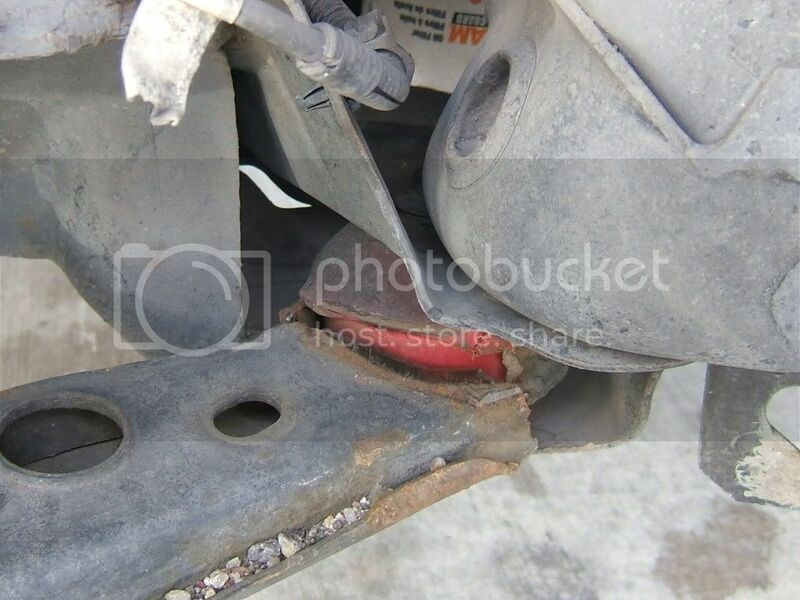 I am sure the poly bushings definitely make the other suspension components do more of their job than the rubber bushings absorbed in the past.